We double checked our packs against the preparatory list, "....Canoe sandals, sunscreen, light gloves, were ready to go," I said excitedly. That evening we would be meeting our guide and fellow paddlers at the Three Stallion Inn in central Vermonts White River Valley. We were looking forward to this two-day trip, "Safari on the White." We had studied BattenKill Canoes brochure, searching the descriptions of Vermont and Canadian trips for just the right combination of river adventure, scenery, and comfortable lodging. The "Safari on the White" trip looked to be an ideal choice with its sampling of both the Winooski and White River, coupled with a stay in one of Vermonts Victorian-era country inns. Courtesy: Three Stallion Inn We found the Three Stallion Inn nestled in the foothills of the Green Mountains, surrounded by 1,300 acres of rolling pastures and verdant woods that comprise this operating horse stock farm. As we walked toward the inns covered front porch, a vibrant young woman bounded down the stairs holding out here hand, "You must be with the BattenKill Canoe safari. Hi, Im Carolyn Parker, the group guide. How was your trip?" Glad to be welcomed so warmly, we introduced ourselves and received a tour of the property and an introduction to the other paddlers. We would have a total of four canoeing pairs, along with Carolyn in her solo canoe. 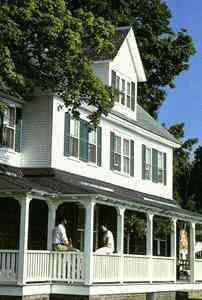 The inn and its property were the epitome of visions I held of Vermont. The white and green shuttered Victorian building was spacious and comfortable, with a ground-floor dining room and bar, and a relaxing porch, where you wanted to spend an afternoon. The pool and hot tub behind the lodge seduced us for a before-dinner respite. At the hearty dinner we enjoyed getting to know our fellow canoeists and Carolyn filled us in on the coming events. After dinner, the miles of trails beckoned us on a hike to savor the forest, meadows, streams and mountain views. Some of the inns guests enjoyed horseback-riding jaunts on the farms Morgan horses. Later, we learned that this valley was the birthplace of the Morgan horse breed in the late 1700s. Courtesy: BattenKill Canoe, Ltd. At breakfast the next day Carolyn asked the group about our canoeing experience to determine the instruction time she would allocate. We had all done some caoneing, but none of us were experts. Carolyn and co-guide, Steve, drove us, canoe rack in tow, along winding roads through quaint, white villages to a wide point on the Winooski. It afforded a comfortable put-in of the canoes and calm water for practicing strokes and maneuvers. My wife and I both mastered the "J-stroke" and "fast turns and reaches" in the hour that we spent under Carolyn and Steves able instruction. These strokes would put us in good stead for the coming two days of river touring. As we took off down the Winooski, Steve climbed back into the van to meet us down river. We drifted through quiet meadowlands with views of distant Mount Mansfield, Vermonts highest peak. Then, paddling vigorously, we maneuvered some mild rapids, exercising our newly learned skills. Although not dangerous, a narrow stretch of tricky turns added to the excitement. Steve was waiting for us at a sandy river bend where he had spread an inviting lunch. We quaffed cold drinks and enjoyed tasty sandwiches and fruit as we discussed the mornings paddle. The exuberance and camaraderie of the group were infectious as we returned to the river for the afternoons jaunt. By the time we again met Steve at a bridge take-out point we were joyously tired, feeling the effects of the days paddling in the sun. The next morning, our energy restored, we were on the roads by 9 a.m. for a short drive through beautiful Bethel and South Royalton to our put-in on the White River. Carolyn exclaimed, "This is one of the most beloved canoe runs in Vermont," as we expectantly readied our equipment. Hitting our paddling stride, we enjoyed a long quiet stretch through a picturesque open valley with quiet rural surroundings. We noted that the White was a bit sportier than the Winooski as we sped past large boulders, then slowed in big pools near steep cliffs. From time to time wed come across a young family of ducklings, skittering across the river to hide in reeds along the edge. When we came to the pool just before Quartermile Rapid, we circled our canoes as Carolyn explained how to take this fast stretch. Each canoe took a 30-second head start from the next, leaving room to maneuver. Quartermile Rapid was clearly the fastest water we had seen. There were no spills, but one of the canoes ended the run spun around by 180°. We all waited in the bottom pool to congratulate each other and swap stories of "close calls." The most thrilling part of our voyage was yet to come. Sharon Dam, an abandoned mill dam, provided a nice two foot rolling drop, and we all enjoyed the excitement of "getting a little air" as we took the plunge. Steve had set up lunch at this point on the beach, giving us the opportunity afterwards to portage our canoes back around the dam for another run. We all took our second plunge whooping and hollering! After two exciting, yet restful days in Vermont, we were hooked by the Green Mountain State. We had started to understand the independent spirit of its residents who so guardedly protect their environment and Vermonts heritage. 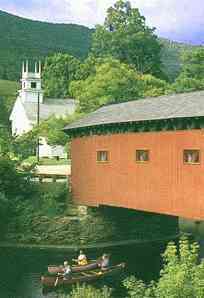 Vermont is embodied in the small village spirit of community and caring for natures gifts. It is no wonder that Vermonts guided tours for inn-hopping, canoeing, mountain biking, and cross country skiing are growing by leaps and bounds. 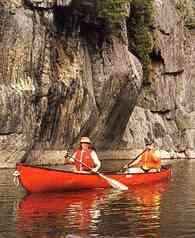 Click here for details to plan your own Vermont canoe trip.